Showing results for tags 'crochet patterns'. I am an avid crocheter in west TN. I started with an Etsy shop and quickly added crochet design patterns to my shop. I've found Ravelry and Craftsy and now Crochetville! I am a SAHM of 5 kiddos whom I homeschool. We live on a hobby farm and I'm the head gardener and chef! So I'm busy, but I crochet and create in my spare time. My design name is Little Monkey Shop. 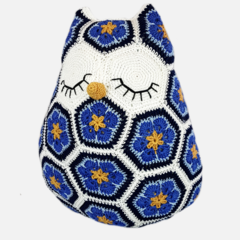 Owl Nesting Dolls and much more! Hi, I'm Holly and I make crochet patterns for dolls: 5" babies, 7-8" child dolls, 11-12" fashion dolls, 12-14" child dolls, 15-16" fashion dolls, 15" baby dolls, 18" child dolls, and 22" fashion dolls. Some of the dolls I've made clothes for are Ellery by Kish, Riley by Kish (along with similar size 8" Betsy McCall, Ginny, mini American Girl, and the dollhouse size Madeline), Barbie (as well as Fashion Royalty, Poppy Parker, and Silkstone Barbie), Little Darlings by Dianna Effner (along with similar size Bitty Bethany by Kish, Ann Estelle by Tonner, and Patsy by Tonner), the 14" dolls by Kish (such as Song, Raven, and Wren), Tyler by Tonner (and similar size Gene, Alex by Madame Alexander, DeeAnna Denton by Tonner, and Princess Diana by Franklin Mint), Bitty Baby (as well as Baby Alive and Cabbage Patch), American Girl (as well as Tolly Tot and Bernat), and the 22" American Model by Tonner. If you are looking for patterns for any of these dolls, check out my Craftsy store: http://www.craftsy.com/user/488549/pattern-store Thanks!